Whether you are walking your best friend, have to take care of a service dog, or have to go on long trips, our dog poop bag holder discreetly holds most types of dog waste bags for you. The easy attach clip or Velcro lets your imagination fly as to how you can most conveniently attach it! Don't let your dog pick-up bags become an obvious attention during walks, use an EzyDog Doo Bag today to hide the waste away! 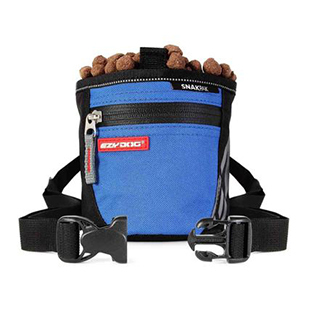 The dog bag dispenser pairs nicely with any of our dog leashes, dog backpacks, or dog harnesses! This is so handy. I have it attached to the handle of the Flexi leash. I use individual bags and can fit about 10 of them in there. I actually use the clip to hold the used bags and it works great. best holder i've found. I used to stuff the bags in my pocket and this is such a big improvement. really makes dog walks more enjoyable. I have purchased 3 of these "doo bags" for my dog. They have lasted about 3 years each. Once, the velcro slightly separated from the pouch, and once, the velcro got filled with fuzz, etc., and it was just time for a new one. This is after a LOT of wear and tear - I would never expect them to last longer. 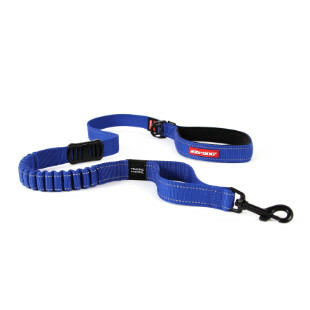 The velcro is very strong, and the double velcro attachment stops the bag from sliding around the leash handle. My two issues are: 1) the velcro lines up such that the stiff side has gotten snagged on my clothes (nylons :( ) a few times, when I am not paying attention, and 2) The elastic end of the bag is loose enough that a roll of bags, with a few bags removed, may slip through. I just tear the bags apart at that point and stuff them in. Regardless, I tried several holders before I found this one, and love this one. I love it except the elastic opening is not very tight n the whole roll of bags falls out. I already lost two rolls that just fell out. I had to put an elastic around the opening to make it tighter. Works great for carrying the bags and other things. I love, love, love, this poo bag holder - I love that it can hold multiple rolls of dog poo bags and I really love that the bag has an extra area to hold my car keys when I take our Shiba Inus, Finn and Evie, to a local park to hike. The extra area is such a great feature - When I take our dogs to the vet, I just slip my credit card and iPhone in the holder and I don't need to worry about juggling my things as we exit and I can focus on walking the dogs in safely. I love this bag. It holds two rolls of bags. Well made, heavy duty construction. A little to heavy for the lite leashes, but it is still great. I really like these bag holders, with one exception. The Velcro straps to attach it to your leash are not attached very well. I had one catch on the door on my way out and it ripped the straps right off. I know this is an extreme case, but I think they should be reinforced.